We all love a good bargain and, if you know your way around a haggle, car booting is a sure-fire way of finding unusual clothes and trinkets for a good price. The best advice for really unearthing the treasure is to arrive for the start; the first hour of trading is when the gold is usually found. Start with a low price, have in mind what you’re really willing to pay, and haggle from there. Here’s our guide to our favourite boot sales in London. This indoor and outdoor affair is jam packed with stalls. Set up in 2010 by stylist Faye Marriott, the crowd is fairly young and trendy, and the quality of offerings is high. There’s a good mix of professional stall-holders and casual clearers – including one friendly regular with a pricey but genuine collection of designer sunglasses – and it’s highly likely you’ll end up a few quid lighter by the time you’re done here. Capital Car Boot Sale takes place at the Pimlico Academy, SW1V 3AT, every Sunday. Entry costs £5 from 10:15am, or £1 from 11:30am till 2:30pm. Battersea Boot is not for the faint hearted. It’s a real wheeler-dealer’s paradise – there are several tiers of entry, with the queues sometimes stretching quite far – and arriving too late in the day can make for slim pickings. Time it right though, and there are some great items to be found here – our trip was rewarded with an Armani denim jacket for £15 – and the pasty stall isn’t half bad either. Battersea Boot takes place at Harris Academy, SW11 5AP, every Sunday. Entry costs £5 from 11:30am, £3 from 12pm till 1:30pm or 50p from 1:30pm till 5pm. Holloway Car Boot Sale is free to enter, and even offers a 20% discount for students at some stalls. There’s no website – this is proper, old-fashioned car booting – but you can rest assured it’s there every Sunday, regular as clockwork. You’ll be hard pushed to find any high-end items here, but there’s plenty for anyone with a keen eye. The 50p Umbro jumper we bought here three years ago is a firm favourite to this day. Holloway Car Boot Sale takes place on Holloway Road, opposite the Odeon Cinema, every Sunday, from 10am till 2:30pm. Entry is free. The first Sunday of every month brings about the Chiswick Car Boot Sale – another first-rate sale where many stalls are run by professional booters and house-clearers. It’s held on the playing field of Chiswick School (during the winter the ground can get a bit boggy) and all the proceeds from entry go to the PTA. There are deals to be had here – but you’ll have to work for them. Chiswick Car Boot Sale takes place at Chiswick School, W4 3UN, on the first Sunday of every month from 8am till 1pm. Entry costs £1. Another trendier option completes the list. Princess May Car Boot Sale’s location in Stoke Newington, and the extremely cheap entry fee, endears itself to young vintage shoppers across town. Like most of the boots on this list, early bird entry is advised for the real bargains, but 7am is terribly early if you’re coming from across town, and there’s still plenty to shop for if you miss it. 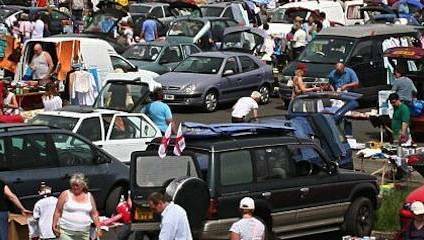 Princess May Car Boot Sale takes place at the Princess May School, N16 8DF, every Saturday, Sunday and Bank Holiday Monday. Entry costs £3 from 7am till 9am, or 50p from 9am till 2pm.